I have complained about Chicago White Sox broadcast announcer Hawk Harrelson since the day I signed up for the MLB package on cable. So today I felt vindicated. Thanks to this video of Harrelson losing his (bleep) over the ejection of pitcher Jose Quintana, I now have evidence to boost my hypothesis that the Chicago White Sox have the most annoying, unprofessional announcers of all time, who can’t hold a candle to Underwood and Manning (Cleveland Indians) Kruk & Kuip (San Francisco Giants) or Dave Flemming and Jon Miller (ditto). Until today I didn’t even know Harrelson’s name; I have disliked him so intensely, I refused to learn it. “There’s this White Sox guy”, I’d complain to friends, “and he’s a complete jerk. I have never heard anything like it!” I’d rattle off his many offenses, like yelling, “stay fair” when a Sox hit is going foul, and referring to Sox players as “our guys” or “the good guys”. Oh, and let’s not forget Harrelson’s folksy catch phrase — “He gone!” – when one of the bad guys on the opposing team strikes out. That one makes me positively nuts, both because it is grammatically incorrect (flashbacks to Sarah Palin) and because Harrelson seems to think he’s so clever when he says it. As it turns out, though, I am not the only person who finds Hawk Harrelson offensive. I am shocked — SHOCKED – to learn this! Repeat after me: No man is an island. You are never alone. More than one-third of Harrelson’s Wikipedia page is devoted to his “catchphrases” and common criticisms of them. There’s also a web site devoted exclusively to his ouster, called Heave the Hawk. During today’s on-air tirade, Hawk argues that umpire Mark Wegner does not understand the game of baseball. An interesting observation from the former White Sox GM who, among other bonehead moves, traded rookie Bobby Bonilla – an eventual six-time All-Star – to the Pittsburg Pirates. 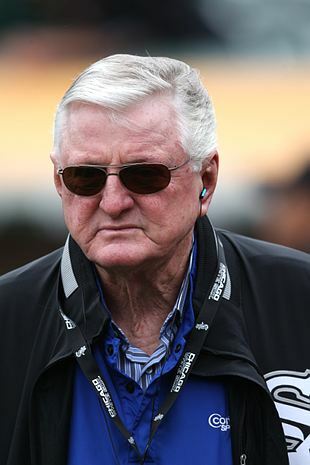 Hawk Harrelson: Love him or hate him? Discuss.